Sometimes a playwright will hit you over the head with “the message.” Sometimes a director will bombard you with gimmicks and distractions. Sometimes actors will ham it up and bring the schtick. But sometimes none of that happens and instead you end up with a beautiful, naturalistic play that takes its time and is funny, poignant and touching That is the case with Annie Baker’s new play, The Aliens. 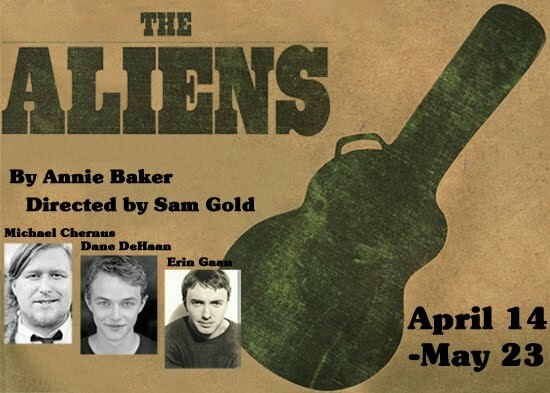 The Aliens marks Baker’s second collaboration with director Sam Gold and the two seem to work really well together. Like in Circle Mirror Transformation, The Aliens is paced so wonderfully: Everything happens in due time, and not a moment before; the writing and directing allows the moments to happen - allows the actors to explore each moment and not rush something just to keep the audience engaged. (The audience does remain engaged, anyway!) Slowly but surely, an emotional story reveals itself out of what seemed like nothing. I applaud Annie Baker, Sam Gold and other young artists who are rebelling against our A.D.D. riddled culture in favor of telling a story with care and patience. My favorite moment of the play came at the end. KJ gives Evan a guitar and asks him to play something. Evan starts playing “If I Had a Hammer” and KJ stops him, asking him to play something original. Evan responds that he doesn’t know anything original - he doesn’t write music. KJ asks why not and Evan says, “I never thought I’d be any good - I’m not a musical genius or anything.” KJ smiles knowingly. He says, “How do you know? Jasper’s a genius. I’m a genius. Maybe you’re a genius. Play that ‘Hammer’ song.” With nervous energy to spare, Evan begins playing the song. As he does, he becomes more and more comfortable and really gets into the song. The smile that washes over him as he clutches the guitar and sings his heart out - as his world suddenly opens up - moved me to tears. Had it not been for the careful pacing and the unobtrusive way each layer was peeled away up to that point, this moment could easily have felt forced and heavy handed - like the writer and director were trying to get me to cry. Instead, they just let it happen. In a theatrical landscape in which the mainstream offers too much glitz, glam and schmaltz, I love little slice-of-life treasures like this. And I’m very much looking forward to Annie Baker’s next masterpiece!